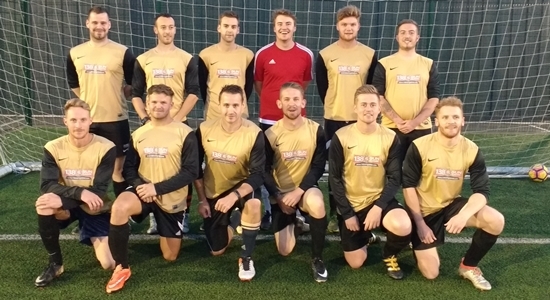 Game 5 was against Simply Skinners FC and was seen as a must win game by Playford manager Max Pryke, Playford Athletico's didn't disappoint. Daryl Francis got the first straight from a corner! A goal that had been coming from the striker and was well deserved! Shorty after Playford made it 2-0, great pressure from the front pairing forced the Skinners centre-back to get the ball caught in his feet and Max Pryke pounced. He spottied the 'keeper out of position and side footed the ball into an almost empty net. Playford continued there busy display in the second half closing down the opposition at every opportunity and made it 3-0 within minutes of the restart. Some great work from substitute Chris Jones as he sent Byron through on goal and finished with a very cool finish lifting the ball over the on rushing Skinners goalkeeper. A Rare defensive blip from Playford gave Skinners a glimmer of hope as Miles Berry played the ball straight to a Skinners Striker, who said thanks very much and slide the ball back into the net. Soon after it was 4-1 the ever busy and full of energy Byron Stretton getting his second of the game. 4-1 was soon 5-1 as Playford were really starting to enjoy thereselves, Max Pryke picked the ball up on the half way line, spotted the run of Lee Andrews and slide the ball into his path. Lee still had work to do beating the centre-back at pace and fired the ball high into the net. But Playford weren't finished there. In arguably the move of the match, great work again from Chris Jones found Byron Stretton's great run down the right. Max Pryke made a run to the front post and Byron found him with a pinpoint cross which Pryke side footed skimmed shot into the left corner of the net. All in all a great performance from start to finish from the Athletico's. Playford went behind early on but responded to the setback well creating two great chances but failed to convert through Daryl Francis and Nico Williams both firing above the bar from around the penalty area following build up play from Byron Stretton and Max Pryke respectively. The Athletico's eventually made there pressure count as Daryl Francis made it 1-1 just before half time with neat finish to the bottom right Playford made it 2-1 just after half time through Byron Stretton but minutes later Steaua were level again as Leon Moye who had been a revelation at the back for the Athletico's was adjudged to have brought down the Steaua Striker inside the area After that setback it was all Playford and should've had a penalty when Max Pryke was brought down inside the area subsequently Pryke was sin binned for foul and abusive language as was his frustration at not being awarded what was seen by many as a defenate spot kick Playford had one more chance in the final minute Charlie Francis heading wide from a Todd Bartlett corner A very disappointing evening for Playford as the game ended 2-2 in match where the Athletico's had enough chances to win the game. With only five of the squad remaining from the previous week, a pretty much all changed Playford side fell to there second defeat. The Athletico's manager had to call on friends from Playford Reserves' opening day Sunday league opponents Amboed Utd. Todd Bartlett grabbed both goals for the Athletico's. Bottom side Flow energy were unable to field a team which gifted Playford there 5th win of the campaign. The competition has given Playford six matches that have supplemented the usual pre-season. A good number of new and existing players have made use of the competitive games to get themselves ready for the Sunday Season. Miles Berry, Dean Harris, Leon Moye and Michael Welham have all impressed and got themselves into the early reckoning for the new season. Byron Stretton got his scoring boots on and has carried that into the early weeks of the season and we wait with interest to see how Nico Williams and Kieron Richardson get on when they make their debuts.